There are a lot of reasons why we began BurgerTour. One was to find the hidden gems scattered around LA. We knew at the outset that Father’s Office would probably have the burger to beat. Not surprisingly, FO was way in front…until this past week. Ebizo’s Skewer in Manhattan Beach put up some big numbers. Now we have a fight on our hands. I spoke with the owner a few days before the planned BurgerTourEvent to warn him about the swarm of carnivores planning to descend on his quaint little restaurant. Unlike the owner of Ercoles (ran out of friggin meat! ), this owner took my warning seriously and agreed to close the doors to the public. Sure enough, at 8 PM we began arriving. In a beautiful symbolic gesture we put up the “Closed” sign and turned our attention to the Kobe beef. While the advertised house specialty is Shabu Shabu (a Japanese meat fondue-thing that is actually pretty delicious), there is also a healthy emphasis on burgers. Indeed, about half of the menu is dedicated to burgers. You can choose between Angus beef and Kobe beef and you can opt for 1/3 lb, 2/3 lb, or the 1 lb belly-buster. Most went with the 1/3 lb Kobe option because it sounded fancy. A lot of us wear fancy pants, so go figure. Interesting alternatives included the burger salad (which was a huge hit with the ladies) and the Ponzu burger (sliced Shabu Shabu-style beef piled high on a bun). Additionally, there were some nice toppings such as fried eggs, avocado, Ponzu sauce, etc. I was the only person man enough to face one pound of Kobe. To make it even more interesting, I had them throw on a fried egg and some Ponzu sauce. It wasn’t hard to pick out my burger as it was cooking on the grill – it looked like a plate for the rest of the smaller burgers. When I got it, I couldn’t speak for a few minutes. It was that good. This beef ecstasy was not without consequences. As many of you know, you sweat out alcohol. So if you’ve been drinking whiskey all night, the next day you stink of whiskey as it sweats out of you. You can shower and brush your teeth all you want. You still smell like booze. Thursday, after eating the 1 lb belly-buster, I could smell the burger juices sweating out of me. No joking. And I was full all day. Woof – that’s the sign of a mighty burger. 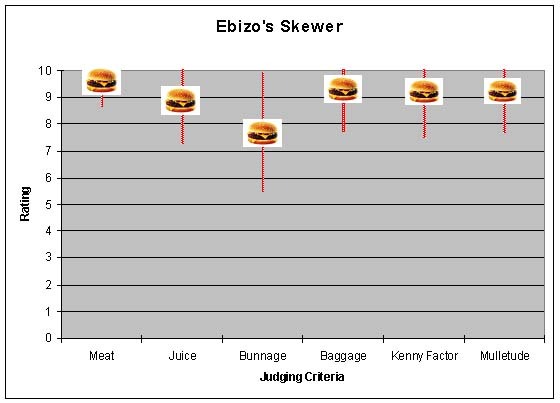 A detailed analysis of the data shows that Ebizo’s took the lead for the best overall burger experience. The data also show Father’s Office with higher burger numbers, but barely. Ebizo’s is truly a hidden gem (at least as long as burgertour.com also remains a hidden gem). Yea for the burger bowl! Yea for closing the doors for Burger Tour! Best BT ever - may have been b/c of the giant beer! If a scorecard falls on the floor, does it need to be burned?